Kalamazoo, MI, June 16, 2016 The Kalamazoo Symphony Orchestra (KSO) and Overneath Creative Collective (OCC) have come together to bring new music opportunities to Kalamazoo. The KSO recently received a gift of a new Steinway D Concert Grand piano from a generous, anonymous donor. The donor has also provided additional funds to maintain, tune and move the piano for the KSO concerts and desired that it be housed at the Overneath recording facility in Kalamazoo, where it will be available for musicians to use for select recording sessions. We are extremely blessed by this wonderful and unique gift, said Peter H. Gistelinck, President & CEO of the Kalamazoo Symphony Orchestra. While treasuring this blessing, we know this wonderful gift will also create plenty of musical opportunities for our community. In late May, representatives from both organizations went to the Steinway & Sons factory in New York on a 2-day trip to select and purchase the piano. KSO Maestro Raymond Harvey was joined by Peter Gistelinck, KSO President & CEO, Gordon van Gent, Co-Owner at Overneath Creative Collective, and D. Marie Jones, KSO’s piano technician. 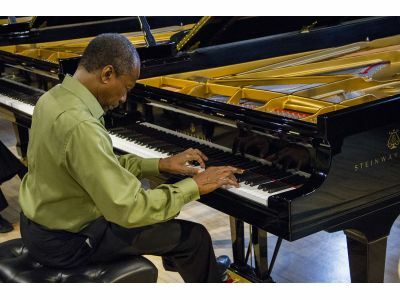 The group toured the factory and assisted Raymond Harvey in selecting the best piano available to serve best the Kalamazoo Symphony Orchestra’s performance while bearing in mind the needs for a grand piano in a recording studio environment. “It was a thrilling experience to have had the opportunity to select our very own Steinway Grand Piano” said Raymond Harvey, Music Director of the KSO. "It was a thrilling experience to have had the opportunity to select our very own Steinway Grand Piano" said Raymond Harvey, Music Director of the KSO. "This incredibly generous donation will enhance the musical excellence for all of our future concerts and is a beautiful beginning step in our campaign to celebrate the KSO's 100th anniversary." By combining the incredible musical talents of Kalamazoo’s nationally recognized symphonic orchestra and Kalamazoo’s most versatile and creative audio and video production company, the KSO and OCC partnership promises to produce world-class symphonic audio and video products for film-scoring, CD releases, and other commercial licensing. “This is a dream come true for us; both by partnering with the unparalleled musicianship of such an incredible symphony in the KSO and by having the magnanimous Steinway D housed in our recording space. We are all so grateful to the generous donor and the teams from both organizations that have worked so hard to forge this musical opportunity in Kalamazoo. Besides the piano simply being available to our clients, the partnership with the orchestra offers a multitude of possibilities- from studio recorded new compositions to film and commercial media orchestral production. So many possibilities!” – Gordon van Gent Owner/Creative Director of Sounds OCC. Overneath Creative Collective is a production house and recording studio in downtown Kalamazoo, MI. Overneath believes that anything worth creating is worth creating well, and their collective of professional creatives use video, audio, photo, and music to partner with their clients and bring their vision to life. Overneath’s Recording Studio is one of the largest studio recording facilities in West Michigan. The studio is a full-fledged Pro Tools HD recording suite with a variety of isolation and monitoring capabilities. With a live recording room able to fit an entire symphony orchestra and numerous isolation rooms tempered for different sounds, Overneath has the space for any ensemble, band, or artist looking for the best recording possible. Visit overneath.com to see our latest visual & sound creations and to start your next creative project. For More images visit our photo gallery!